EARS shows how HEYER’s products and services are supporting the market need for solution that further advance the efficiency of operationing rooms and healthcare providers overall EMR/EHR inititives. 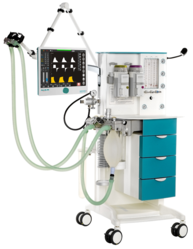 HEYER Medical, AG in partnership with its technology integrator, SENGEX LLC, are pleased to announce the development of Heyer’s Electronic Anesthesia Record System that will be highlighted at MEDICA along with its newest Advanced Anesthesia Machine called AdAM. Heyer’s Electronic Anesthesia Record System (EARS) has been specifically designed for anesthesia providers to address the need for increased situation awareness achieved through eliminating “paper-based” recording , and moving this process to the digital age. Heyer’s EARS interfaces directly with the anesthesia machines vital signs monitor and receives all monitored patient data instantaneously during the procedure without any intervention by the anesthesia provider. EARS has been designed to seamlessly interact with Heyer’s new Anesthesia Machine - AdAM. However, Heyer EARS can receive data from other anesthesia monitoring devices regardless of manufacturer and is not dependent on the purchase of AdAM. “In today's demanding healthcare environment, enhancing operation room medical equipment capabilities to allow medical professionals to achieve greater situation awareness, and reduced distractions can result in increased patient care and medical procedure success”, said Klaus Schickhaus, president of Heyer Medical AG. “Through our development partnership with SENGEX, EARS shows how HEYER’s products and services are supporting the market need for solution that further advance the efficiency of operationing rooms and healthcare providers overall EMR/EHR initiatives. Visit HEYER in Hall 11 B19 at MEDICA to see a demonstration of EARS, or visit http://www.heyermedical.de to learn more about EARS.. Founded in 1883 by Carl Heyer, Heyer Medical AG is an innovator in inhalation technology for the treatment of respiratory tract diseases. The company is still in its original location of Bad Ems, a health resort with a long tradition, idyllically situated on the River Lahn between Frankfurt and Cologne. Heyer has offices in the U.S.A and China to include assembly facility in Beijing. The SENGEX solutions/system integration team has extensive experience as a state of-the art technology provider, along with its vast knowledge base in Operating Systems (OS), IT networking, IT security, and database management. SENGEX has been supporting Heyer Medical for over three years with critical technology consulting, software development and systems integration. SENGEX utilizes a three pillar evaluation process that results in recommendation, demonstration, and implementation of the best technology that meets customers’ specific systems requirements and business demands.